Now there are loads of ways of test your intelligence but this is a great starter for a shape and space Maths lesson. Let’s see how intelligent you are, how many triangles do you see? This would make a great plenary to a Maths lesson too! Look at the diagram below and see how many triangles do you see? Please also use the voting button below to share your answer! Also, make sure to checkout the resource for the animated solution to the “how many triangles do you see?” problem Buy now. If you enjoyed using the resource above then make sure to check out the games and tricks available to help develop, practice and learn times tables skills. You will be amazed with what happens to kids when they play these times tables games and learn these times tables tricks and cheats! Thanks for taking the time to answer! Will post an. Answer soon. Nice try John…but the word “triangles” is NOT a TRIANGLE, its a word…and a PLURAL word at that. FAIL. 14 is not the answer never has been, never will be. If people think triangle the WORD is a shape, well I think you need to go back to 1st grade and get your education. Have commen sence, the word doesn’t count. I’m only in 5th grade, and honestly I’m not the smartest cookie on the block but saying that there is 14?!?! That not even in the choices!!!! Ahaha John, that is so stupid. You know very well what they mean. And if you want to do it your way, then there are actually 16 triangles! LoL!!! Agreed. I say that the wording stipulates that we were searching for triangle(s). The fact that there are more than 1 is what speaks to us looking for triangle(s). There was no differentiation stating we were to look for “triangle(s)”. Words or shapes were not mentioned…This leaves us to say there are 14 in total. actually if you’re going to go that in depth, you also would have to include the triangle that occurs in the center of the number 4 in the answer key. 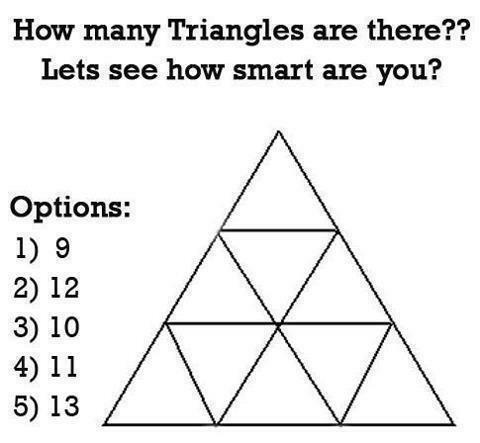 This would bring the total to 15. including all 13 in the real test, the word triangle, and the small one in the answer key. Very clever and out of the box thinking. 1/1 for creativity 0/9 for interpreting the question. I agree with John, 14 is the correct answer. ugh,! got a problem with 14, only counted 13, and the highest option is 13. 14 is not an option for an answer, how could it be? There are 13 total triangles: the whole triangle (1), each small one (9), and the 3 triangles that contain 4 small triangles. there are 10 triangles 1 large triangle and 9 inside that, 1 at the top, 3 in the middle and 5 at the bottom. Only an english major would say 14. Word tricks can be funny but not mathematical or tests of intelligence. Cleverness perhaps. 13 is the correct answer. I’m in school for mechanical engineering and I got 14 also? So that’s a no go on you opinion, it’s called the answer it didn’t ask how many triangles in the pic below? it says “how many triangles are there?? If you ask that question without assuming or prejudging anything you look and see 13 “triangles” in shape form and 1 “triangles” in the question for a total of 14. I think it’s fairly obvious and something this simple wouldn’t test ones intelligence just by counting triangles. NO, there are 15. look at the overlapping lower ones. There are thirteen triangles. The whole triangle plus the obvious nine plus the top, bottom left and bottom right triangles each containing four of the small triangles. Fourteen is incorrect…for one reason it is not one of the options. And it would be silly to consider a word a triangle. CLEARLY YALL YOU GUYS CANT READ! THE QUESTION WAS HOW MANY SO YOU SEE!!!!!! KEYWORD IS SEE! NOT HOW MANY ARE THERE! THE TRICK IS THEY WANT YOU TO CALCULATE ONLY THE ONES THAT ARE VISIBLE TO THE EYE….NOT THE THE ONES YOU CANT SEE LOL!!!! And, clearly the eyes see 13. Um no… Actually it says exactly “how many triangles are there?? Let’s see how smart you are? Never does it ask how many do you see. Read things slower so you understand what your talking about and don’t look like a fool. Remy…I SEE an infinite number of triangles when I cross my eyes. Seeing is not always an accurate method of determination. A great powerpoint to show my pupils the answer! Thanks for that, finally something to demonstrate a proper answer! The solution can be found below. What is all the debate about there are 13 triangles. 14? No wonder Americans are dead last in Mathematics. Or if your timing by 3 it would be three times 13 which would be 39. or in a real triangle that has five sides it would be 5 times 13 which would be 65 but that would make it a pyramid lol..